Nevada Day Festivities Will Celebrate the 148th Year Since Joining the Union! Oct. 25-28. By John_Hamilton on October 16, 2012, 1:19 pm Comments Off on Nevada Day Festivities Will Celebrate the 148th Year Since Joining the Union! Oct. 25-28. October 16, 2012 (Carson City, Nev.) — Nevada Day festivities will celebrate the 148th year since joining the union with the theme, “Honoring Our Military and Families Past, Present and Future” (http://nevadaday.com/index.php), Oct. 25-28. Most states celebrate their entry into the union with a few speeches and maybe some state capitol-flavored pomp and circumstance. Nevada, however, does things different. It throws a four-day party in Carson City and everyone — whether they’re a resident or not, is invited. Nevada’s observance is recognized as the largest all-statehood celebration in the Nation. Along with carnival rides, music, comedy, street parties and Saturday’s famed Nevada Day Parade, the lineup includes the addition of a “Battle Born Days Celebration” with a salute to America’s military that includes a traveling Vietnam Wall, living history re-enactments, tributes and military honors, aircraft and weapon displays, a USO dance and Bomber Girl Pin-Up Pageant. Nevada Day celebrates the Silver State and its rich Wild West spirit that sweeps from the great silver mines, railroads, towns and cities that dot the landscape from Las Vegas to Gerlach and all points in between. Only in Carson City will visitors see cowboys and miners ham it up with card sharks and climbers during the nation’s most enthusiastic, larger-than-life Nevada Day statehood parade that runs three hours and stretches four miles. At any given moment on parade day along Carson Street, visitors will see the best of the state’s high school marching bands intermingled with hundreds of horses, led by boot-clad men with Old West chaps, flowing beards and a turn-of-the-century spirit. The ladies of the Wild West are clad in garb that range from Victorian conservative to saloon risqué. Food fare around Carson City is authentically cowboy, with cast-iron pots brimming with bean, bacon, chili and stew concoctions, cornbread and plenty of brews and sarsaparillas to wash it all down. Battle Born Day festivities are schedules at various times and locations. Visit www.battleborndays.com for details. RSVP Fair will provide carnival rides for adults and children at Mills Park in Carson City; Hours are 4-10 p.m. Thursday and Friday, Oct. 25-26, and noon-10 p.m. on Oct. 27-Oct. 28. Nevada Day Governor’s Banquet at Grand Sierra Resort Summit Pavilion, Reno. The past, present and future roles of Nevada’s military and their families are being honored as part of this event, hosted by Gov. Brian Sandoval. Proceeds from the event go to Gold Star Families of Nevada and Blue Star Mothers. Nevada State Museum will host tours all day Friday and Saturday, from 8:30 a.m. to 4:30 p.m.
Comedian Paula Poundstone of NPR’s “Wait, Wait Don’t Tell Me” fame will roll out the laughs and ring in Nevada Day with a performance at the Carson City Community Center. Show starts at 7 p.m. Tickets cost $35 and can be purchased online. 74th Annual Nevada Day Parade hosts magnificent floats, high-stepping equestrian units, and spirited marching bands from throughout the state from 10 a.m. to 1 p.m. The traditional 10 a.m. flyover of military aircraft from the Fallon Naval Air Station and Nevada Air Guard will kick-off the parade. 23rd Annual Carson Nugget Nevada Day Classic Run/Walk will feature hundreds of runners and walkers in Carson City’s historical downtown district. The event begins at 8 a.m. and includes an 8K run, two-mile walk and two-mile fun run. Got whiskers? Check out the annual Nevada Day Beard Contest at the Capitol Amphitheater immediately following the parade. Winners awarded in the following categories: longest; fullest; reddest; whitest; blackest; best salt and pepper; best groomed; scruffiest; and most bearded community. What’s a Silver State celebration without a mining and drilling competition? The 35th Annual World Championship Single Jack Drilling Contest will be at the Carson Nugget parking lot, beginning at 11:05 a.m. Contestants competing for a $5,500 grand prize have ten minutes to drill holes in Sierra White Granite using pound hammers and bits of graduated steel. The contest celebrates the heritage of the Comstock mining days when blast holes for dynamite were punched into ore bodies by hand. The world record was set in 1993 at 16.34 inches deep by Scott Havens of Elko, Nev.
An Old West flap-jack breakfast hosted by the Carson City Republican Women’s Club at the Governor’s Mansion from 7 to 9:30 a.m. Chew the fat with those who dare say they’re politicians and those who aren’t. Proceeds benefit scholarships to Carson High School and Dayton High School students. 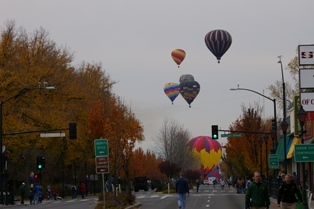 RE/MAX Realty affiliates will host with the Nevada Day Hot Air Balloon Launch on Carson Street adjacent to the Carson Mall. Starting with a mass launch at 8 a.m., Team RE/MAX will fly its signature hot air balloon along with dozens of hot air balloons over the city. Sponsorships to get a chance to ride in one of the balloons are available at (775) 841-1000; last year, the event sold out so reserve your spot today. Nevada Lt. Gov. Brian Krolicki will host the 30th Annual Chili Feed at the Carson Nugget’s Banquet Center. This noon to 2 p.m. event is an opportunity to meet and mingle with state and local leaders. After it ends, join Krolicki on a tour of the Governor’s Mansion from 2 to 4 p.m. The Nevada State Railroad Museum is commemorating the last run of McKeen Motor Car, No. 22 on the V&T line, which was on Nevada Day in 1945. This transport, which runs from 10 a.m. to 4 p.m. will take any rider back to the days where rails ruled and the squeaky wheels were those made of steel and iron that turned on the miles of track. The historic car resembles a yacht on tracks with round porthole windows for viewing, mahogany interior and rich elegant exterior. The Nevada Day Party continues with Antsy McClain and the Trailer Park Troubadours, 8 p.m. at the Brewery Arts Center. Tickets can be purchased at www.breweryarts.org or by contacting the Brewery Arts Center box office, (775) 883-1976. The Capital City Community Band will open its 34th concert season with a free old-fashioned band concert at the Legislative Mall amphitheater at 3 p.m. The band will perform Sousa marches, Broadway tunes, patriotic music and even have their own musical locomotive race. For more information on all Nevada Day events, log onto www.nevadaday.com. A world of culture, history, dining and adventure awaits in Carson City. For the latest in summer travel deals, lodging, activity information and further details on the destination, visit www.VisitCarsonCity.com or call 800-Nevada-1.